We are offering a wide range of Attachment Conveyor Chain. Our Special Conveyor Chains are manufactured using quality material to enhance their strength and ideal for use in material handling equipment. Our conveyor chains are very much resistant to corrosion and temperature fluctuations. 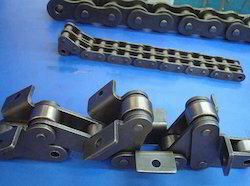 Apart from standard sizes, we also offer these conveyor chains in customized forms to meet the expectations of our client's. Looking for Attachment Conveyor Chain ?